So I thought I’d post a quick picture of my soldering setup. Before the picture though, I do have some things I want to acknowledge. First, I understand that having some form of anti-static mat is extremely important. I just moved my office though, and haven’t had time to set everything up yet. 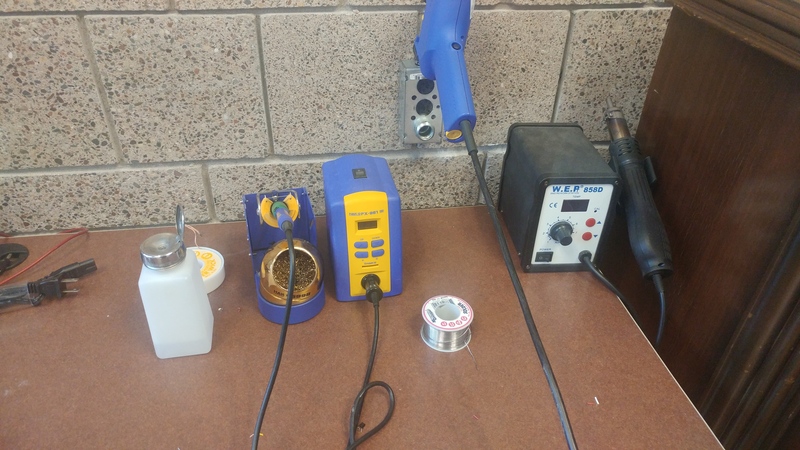 Second, I strongly recommend the Hakko FR-300 desoldering gun, and the FX-951 soldering iron. They are pretty pricey for hobby-grade stuff, but they are so nice. I have used super cheap soldering irons my whole life, most recently the Weller WLC100, and when I finally got this for work it was an entirely new experience. The handle is so light, it heats up so fast, the tip changes super easy, it is worth every penny in my opinion. Anyways, here’s my current setup.